Leaving a gift to Strawberry Hill Trust will support the ongoing care and restoration of the House and Garden. 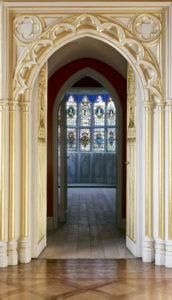 HOW DO I LEAVE A GIF T TO THE STRAWBERRY HILL TRUST? We are most grateful for your interest in leaving a gift to Strawberry Hill Trust which will help us preserve the house for future generations. • A residuary gift is the share of your estate left over once your family has been taken care of. • A pecuniary gift is a specified amount of money left to Strawberry Hill Trust and can be directed towards a specific aspect of our work. • A reversionary gift allows you to leave your estate to your dependents while they are living, but after they pass away it will revert to Strawberry Hill Trust. Including your wishes in your Will is straightforward. If you already have a Will, all you need to do is add a codicil. We do however recommend that you also consult your family and a solicitor. There are Inheritance tax advantages in willing money to charities and advice on this can be sought. We will treat your pledge in complete confidence.